Although this projector cannot compete with larger and more powerful cinema or gaming projectors, we have found it to be an amazing piece of technology. It is easy to use, it is easy to transport, and it is fun for those who want to watch an occasional movie or Netflix series on a larger screen. This is why we have selected the Anker Nebula Mars II as our top pick portable projector. Having a cinema projector in the home is the dream of most individuals looking to build a home theater. Cinema projectors make it possible for an individual to watch their favorite programs or play their favorite games on a large screen without purchasing an expensive television. Some of the more expensive projector models are difficult to install. This is where the the Anker Nebula Mars II stands out above its competition. This projector represents the best in portable mobile projector technology. It is one of the first projectors to make the idea of a portable projector attractive. One of the reasons why we have selected this item as our top pick is because it has a price point that puts it close to what one would expect to pay for a pico projector. However, it offers a number of features that put it beyond the other portal projectors that are currently on the market. One of the features that we like about this projector is its size. It weighs just 1.79 kg. There are a number of Bluetooth speakers that are larger than the Anker Nebula Mars II. This makes it the best option for someone looking for a projector that is easy to transport. It has a futuristic design. If we were to describe it, we would say it looks like a cube that someone has squashed and then removed the edges of. When you look at the front of the projector, you will see the projection lamp. There is a cover that can be pushed down to protect the lamp. When the lamp cover is lifted up, it automatically turns the projector on. You’re also going to see four LED lights. These lights represent the amount of battery charge that is left in the unit. When you look at the back of the unit, you will see openings for ventilation. Even though this is a smaller projector, the unit still can get hot if it is used for an extended period of time. As we mentioned in our “Pros and Cons” section, we are not a big fan of the proprietary DC in jack. They could have simply used a universal USB jack for the power supply. It would have been so much more convenient. On both sides of the projector, you will see the speaker grills. These speakers are what give the Nebula Mars II great sound. There are a few other specs that made us really appreciate this unit. The projector has 720P output. While this might not be impressive for someone who has a 4K projector, it is pretty impressive for such a small unit. The projector has 300 ANSI lumens. If you’re using this unit in a dark room, you’re going to be more than pleased with the results. When it comes to the screen size, you should expect to get approximately ten inches of screen size for every foot or so you put the projector away from the projected surface. The maximum screen size you can get is 150 inches. However, at max size, you’re not going to have the best clarity. We recommend that you keep the projector between eight and 10 feet away from the projected surface to get to the best image. We feel that the battery life of the built-in 12,500mAh rechargeable battery is impressive. Without plugging the unit in, you should be able to get around four hours of video playback. If you opt to use the unit as a Bluetooth speaker, you will be able to listen to up to 30 hours of music with just one charge. The unit comes equipped with a tailored version of Android 7.1. This allows you to use apps like Amazon Prime and Netflix with the projector. All you need to do is turn it on and connect the unit via its built-in Wi-Fi connectivity. We see this as a good projector to add it to your traveling entertainment package. If you are not looking for something to use in bright meeting rooms and you’re not looking for something to use during the day, this is the right option for you. The speakers are sufficiently loud, and the battery power is enough to make this unit worth the purchase. It is the best portable projector we have reviewed. The Optoma IntelliGO-S1 is a smart projector designed with sturdy materials. It has a number of connection options, making it a powerful A/V tool. We feel that the features it offers makes it a great deal. This projector is able to display images in full 720P. The native resolution of the projector is 1280 x 720P. This means that you are able to play 1080P videos. We did not notice any issues with motion blur or latency. The projector offered true colors that were crisp and vivid. Our only comment on the color is that, at times, they appear to be excessively saturated. This projector has a 500 lm lamp. It offers a 15,000:1 contrast ratio, which makes the images look stunning. The 500 lm lamp works decently if there is ambient light. However, it works best if you are in a room that is dimly lit or that is completely dark. This unit has a throw ratio of 1.2:1. It has the ability to produce a screen that is up to 150 feet. However, we feel that your best images will be seen somewhere between 80 and 100 feet. Take advantage of the picture focus and keystone options to improve the appearance of your image. This projector runs Android 4.4. You can choose to download some of the more than 700,000 apps and store them on the 8 GB internal memory. Our only complaint with this unit is that it does not have an internal battery. This means that it needs to be plugged in to function, making it less portable than some of the other units we have reviewed. The projector contains many keystone functions allowing users to get the most optimal picture from any projector angle. The WiFi capabilities makes it more accessible to other devices which in the long run will help to reduce the amount of wires in the area where the projector is being used. The Epson EX3260 is one of the largest portable projectors that we are going to review. Even though it has a larger dimension and weighs a little over five pounds, it is still sufficiently portable so that you can move the device from room to room. It is a great option if you need a projector to use on the go. We evaluated the brightness, color rendering, and image crispness and were pleased with what we saw. This projector works well when viewing animated content, sports, or cinema. It works in both bright and dark environments, offering a clear image. One of the features that surprised us was the sound quality of the speakers. In a number of the other projectors reviewed, sound quality seemed like something that was an afterthought. But we could tell that with this projector sound was something that was taken into consideration during the engineering of the unit. It is able to produce sufficient sound to fill a medium size room. The Epson EX3260 has strong specs. There are a few connectivity options we would have liked to have seen on this projector, but overall it offered a stellar build and quality image. The LG PH550 offers a number of features that make it a versatile product. You will find it beneficial whether you’re looking for a portable home projector or a projector that you can use in business. This is a compact size and lightweight projector that has a rechargeable battery. Many view it as a portable big screen television because this unit has a built in TV tuner. It also has a coaxial connection, allowing you to use cable or an antenna. Just a little bit bigger than a paperback book, the projector only weighs 1.5 pounds, so it is easy to transport. It uses a 720P DLP chip as well as an LED light source. The projector is rated at 550 lm. You can easily project a 55 inch image in a living room with ambient light and still get a relatively clear picture. Of course, this is a 720P projector, so it’s not going to have the same detail that you are going to see with a 1080P projector. However, it offers an improved contrast when compared to some of the other models that we have reviewed. The unit comes with five color presets, which are customizable. We found that this unit does an admirable job of handling video. It has near excellent color quality. We saw good shadow detail, even when we were looking at text clips. Unfortunately, the contrast ratio on this unit is low. In some areas the black will show as a glowing gray. This is more apparent when you use the unit in a dark room. The unit comes with a 1 W speaker. This is not designed to be your primary audio source, but it will work well if you are in a pinch. The unit supports 3D input from videos and will work with the DLP link glasses. We were surprised at the low lag time of 34.2 ms. This may not be what a professional gamer is looking for, but it is more than enough for people looking to have a good time playing online games with friends. This is a good portable projector if you want to watch movies, stream TV, or play video games. Its battery lasts 2.5 hours, making it a good choice for someone looking for a projector they can use on the go. This is a strong option for use at home and in the office. It offers a high definition picture and stereo sound wherever you are. The Miroir M300A makes it possible for you to enjoy a high definition picture and stereo sound. This is one of the smaller projectors we will evaluate. When you have it in your hand, it feels like you are holding a larger smartphone. The Miroir M300A does a good job at handling video and audio. However, its audio performance is where it stands out. The Miroir M300A allows you to project an image up to 100 inches. The image is clear, and there is no motion blur. The unit is equipped with a 400 lm LED lamp that has a life of up to 20,000 hours. The unit has a low contrast ratio of 400:1. This means that sometimes dark blacks come across as brighter gray. This projector works with Android 4.4 and offers a number of streaming apps that can be downloaded onto the device. It’s easy to search the apps and customize their appearance and location on the projector’s home screen. You have the option to view content from the USB port or an HDMI connected to a device. There is no microSD slot, so that limits the content you can use. The unit comes equipped with a standard remote control for navigation. We were pleased to see that the Miroir M300A is able to automatically adjust focus and keystone, so your images will always display the way that you want them to. If you play your content on battery power only, you will get 90 minutes of use. The unit can be recharged using a USB – C connection. The AAXA M5 is a pocket class projector. It has three RGB LED lights. These lights make it possible for the projector to re-create the entire color spectrum. This is a single-chip DLP projector. It is perfect for office or home use. The AAXA M5 offers 500 lm when operated using the battery and 900 lm when plugged in. It has a resolution of 1280x800, making it a flagship portable projector. The AAXA M5 is useful in a number of situations, including home entertainment, casual gaming, as well as creating presentations on the go. It has been used in classrooms and in conference rooms where there is no permanently installed projector. Although it is a little bit larger than some of the other projectors we have reviewed, it is still quite small, weighing in at less than two pounds. The unit is able to produce clear images, even when there is ambient light. This projector has 20,000 hours of lamp life. This means that you will likely need to replace the projector before the lamp goes out. The projector comes with a built in media player, allowing you to give presentations without using a PC. However, this unit lacks Bluetooth connectivity and wireless screen monitoring.Overall, we are pleased with the functionality of this unit. How many lumens will you need to project during the daylight? In a home theater or a dark room, you will want to project between 1000 and 1200 lm. When there is ambient light, a 2000 lm projector may be your best option. How long will a portable projector last? With most projectors, the first thing to wear out is the lightbulb. Many portable projectors use LED lights. That means that a number of the projectors we have reviewed have bulbs that will last in excess of 20,000 hours. This means that your projector will likely become out of date before you will need to replace the bulb. A portable projector is a convenient and on the go solution for individuals who need to project images or videos in a variety of situations. They can be used in the classroom, in a business environment, as well as in home theaters. Portable projectors are not as bright as non-portable units. Many of them have 100 lm or less. Should I get a DLP, LCD, or LED projector? The answer depends on what you want from the projector. For example, if price is your primary concern, you may want an LCD projector. LCD projectors do not have moving parts, so they are less expensive. 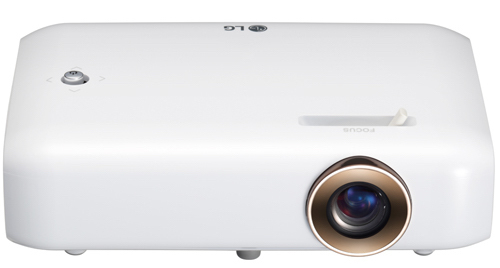 If image quality is your concern, then you may want a DLP projector that offers truer colors. Many portable projectors use LED technology because they produce less heat and require less energy. The downside is that they are not as bright as their counterparts. ​Contrast ratio is the difference between the black is black and the white is white on an image. However, just because a contrast ratio is larger does not mean that it’s better. For example, a projector that has a contrast ratio of 10,000:1 is not going to be five times better than a projector with 20,000:1 ratio. Other factors come into play, including how well the projector is able to show the shades of gray between the whitest white and the blackest black.